The Anantara hotel in Chiang Rai has announced that the 2009 edition of the highly popular King’s Cup Elephant Polo Tournament will take place from March 23 to 29. As usual, a blessing ceremony will be held before the opening match, in which monks sprinkle holy water over both players and animals to ensure a successful tournament. In addition, a parade of northern hill tribe villagers and dancers in traditional costume, elephant spirit men (Khru Ba Yai), colourfully decorated pachyderms and teams holding up their respective country flags will kick off the week-long competition held on the banks of the Ruak River which divides Thailand from Burma. During the first five years of the tournament, the event took place in the royal seaside town of Hua Hin before moving in 2006 to the native home of elephants – the Golden Triangle. The tournament was introduced to Thailand in 2001 by Anantara Resorts and is a charitable event that raises money for the country’s National Elephant Institute in Lampang. Since its induction in 2001, the tournament has gone from a small two-day event with six teams into a week-long extravaganza, which in 2008 featured 12 teams from four continents encompassing 40 players from at least 15 countries. Through its own elephant camp, located within the grounds of the Anantara Resort Golden Triangle, the property’s focus on the future of Thailand’s pachyderm population forms an integral part of the resort’s operations. On an ongoing basis, resident elephant camp director, John Roberts, works closely with the Thai government’s Elephant Conservation Centre in Lampang to develop Anantara’s camp as an elephant sanctuary. To date, the tournament has raised over $200,000 for the National Elephant Institute, which provides medical care, sustenance, employment, and mahout training to Thailand’s elephant population. Funds raised in 2008 were used to run the custom built ambulance that was donated at the opening ceremony of that year’s tournament. It is estimated that Thailand has around 2,500 domesticated elephants and 1,500 wild elephants, down from an elephant population of around 50,000 in 1950 and 100,000 in 1900. The Tourism Authority of Thailand (TAT) fully endorses the King’s Cup Elephant Polo tournament, having identified it as one of the country’s prime annual special events. It will take place in the grounds of Anantara Resort Golden Triangle, with free spectator entrance. 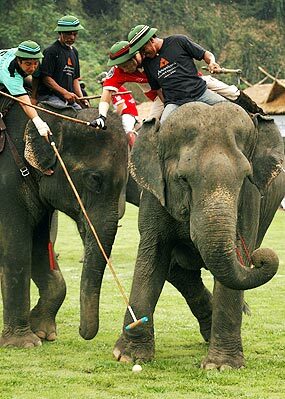 For more information on King’s Cup Elephant Polo, please visit www.anantara elephantpolo.com# Anantara Resort Golden Triangle is located 60km north of Chiang Rai’s international airport. For enquiries and reservations, please call + 66 (0) 5378 4084 or + 66 (0) 2 477 0760 or email [email protected] anantara.com. For more information please visit www.anantara.com. Sunday, Feb. 22 saw the Colts demolish the Irish Pub in a one sided match at Prem Centre. Batting first the Colts amassed 7/230 with Anchu scoring a brisk 100 runs. The only bowler of note was Wally Pohl, who bowled accurately to take 2 for 35. Makki Assadi bowled a lively spell against the visiting Bahrain national team. In reply the Irish Pub was all out for 102 in a lackluster batting performance. Two days later on Tuesday, in a hastily arranged match, again at the Prem Centre, the Bahrain national team made short work of the Chiang Mai Cricket Club side in a 25 over game. Winning the toss and sending Chiang Mai in to bat, Bahrain dismissed the locals in 13.4 over for the measly total of 72 with only Makki Assadi offering any real resistance with 15. Bahrain reached the required score in only eleven overs, Thinley Norbu picking up two wickets and Makki Assadi assisting with one wicket in a lively spell. Next weekend the Parrots and Southerners will each bring two sides from Bangkok to Chiang Mai for a series of matches on Saturday and Sunday at both the Gymkhana Club and the Prem Centre. On Saturday Parrots A will play Southerners at Prem and Southerners B will play the Cockatoos at the Gymkhana. Sunday will see Parrots B versus Southerners B at the Gymkhana. All games will begin at 11.00 am.